2-1. The CRISPI main page. 3-3. Graphical circular view of a genome. We propose a web user interface to explore the CRISPR's database at various levels, a Blast interface to extract information from this database and the possibility to find CRISPR structures in a personal sequence. 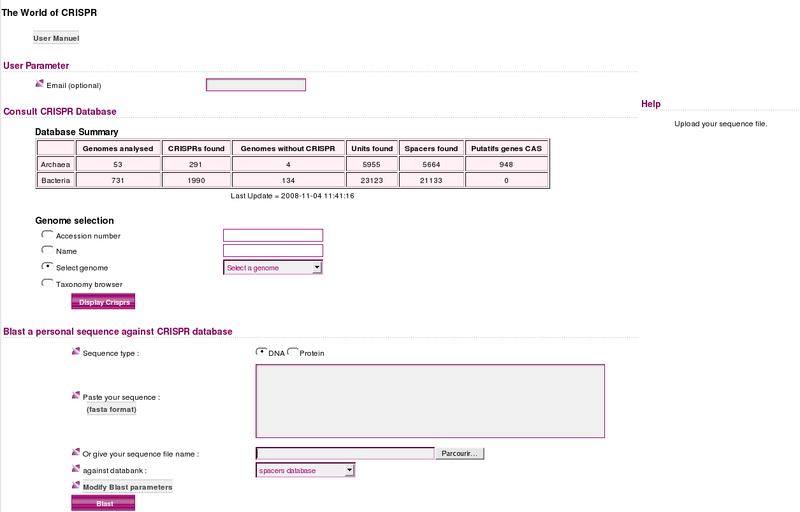 The main page of CRISPI contains three search forms divided into two sections: search parameters on the left and help messages on the right. Help messages are hidden until some values are typed in form's fields or the mouse is over the field or the question mark. Three search forms are available : the first one to consult the CRISPR database, the second to run BLAST on a personal sequence against the CRISPR database and the third to find CRISPR in a personal sequence. Figure 2-1. The CRISPI main page. In this area, you can enter an email address. It will be used by CRISPI to send you a message at the end of the job. The email message contains a reference to a confidential result file that can be accessed for 10 days before deletion. 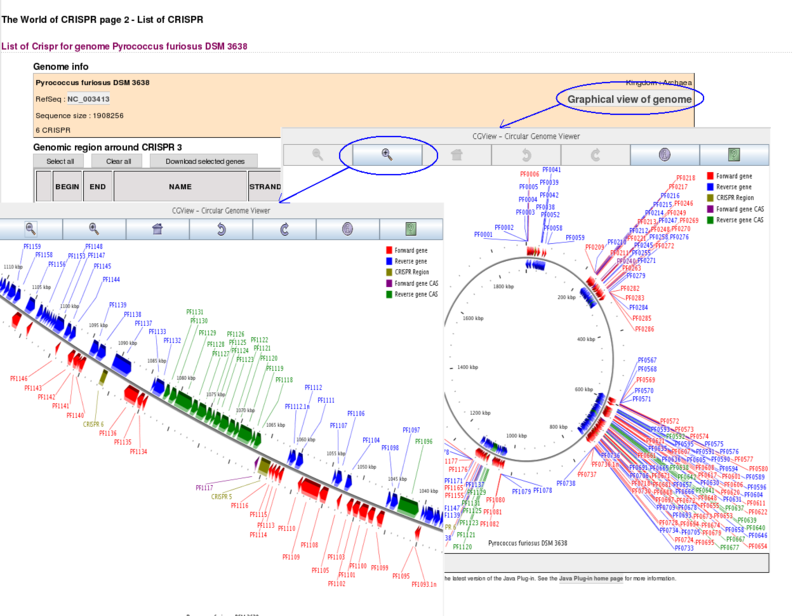 Note that this option is only available for the BLAST and Find CRISPR functions : consulting the CRISPR database requires no computation and results are immediately available through the interactive viewer. Entering an email address is optional, but is recommended. Providing your email address ensures that CRISPI will always inform you on job termination. Microbial genomes have been pre-processed for an efficient search of particular CRISPRs structures. This table summarizes the statistics of the database and provides a global overview of CRISPRs present in the database. By entering the accession number. By entering the genome name (or a part of it). By selecting a genome in the genome list (lexicographically sorted). 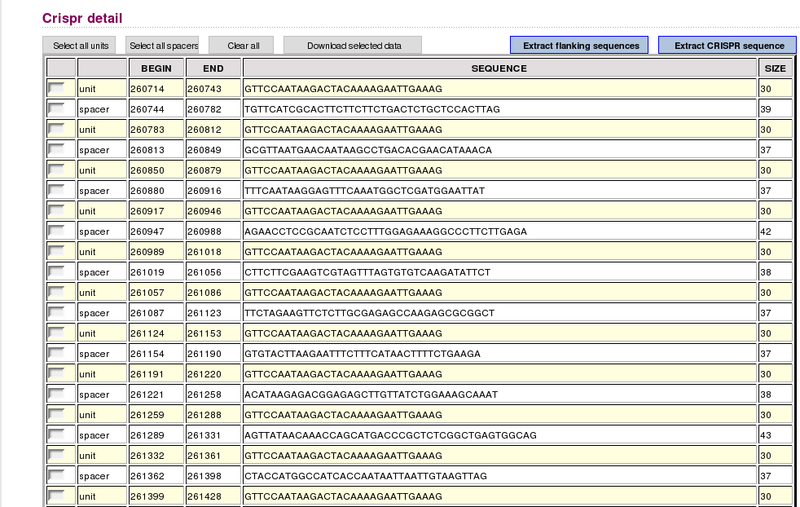 By selecting a genome in the taxonomy browser. Once all parameters have been edited, click on the [Display Crisprs] button to go to the next page. The query sequence must be in Fasta format (DNA or Protein). One can either paste the query sequence into the input field or upload it from a file on the local machine (files with multiple sequences are allowed). BLAST can be launched against units or spacers. For protein sequence, a preferred substitution matrix must be specified. Default BLAST parameters have been optimized, be careful if you modify them. 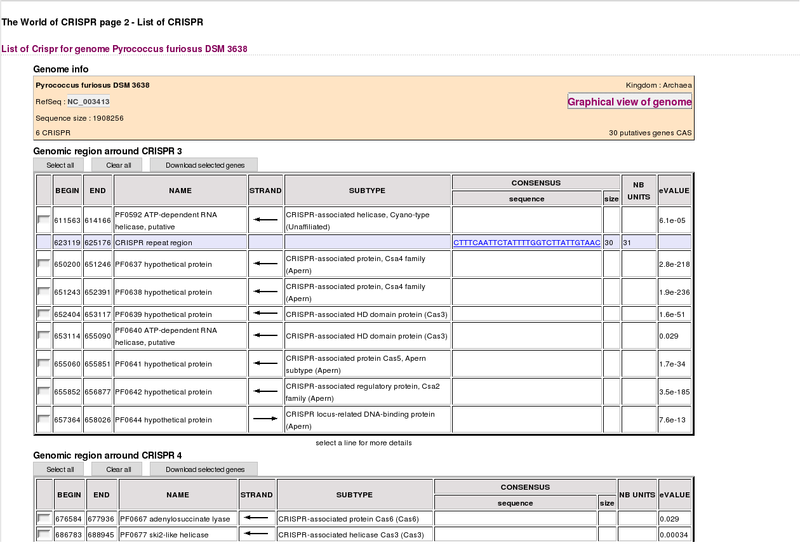 The BLAST result page is cross-linked with the CRISPR database. The query sequence must be in Fasta format (only DNA sequences are allowed). One can either paste the query sequence into the input field or upload it from a file on the local machine (multiple sequences files are not allowed). Results are summarized in a table. Results can be notified by email (optional). 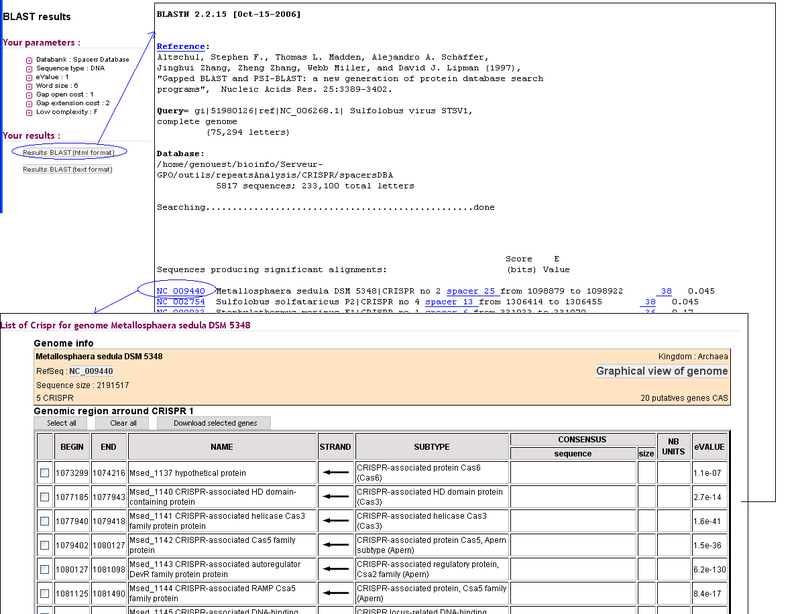 Once a genome has been selected, results are summarized inside tables. Each CRISPR is highlighted and all CAS genes found in its vicinity are displayed. 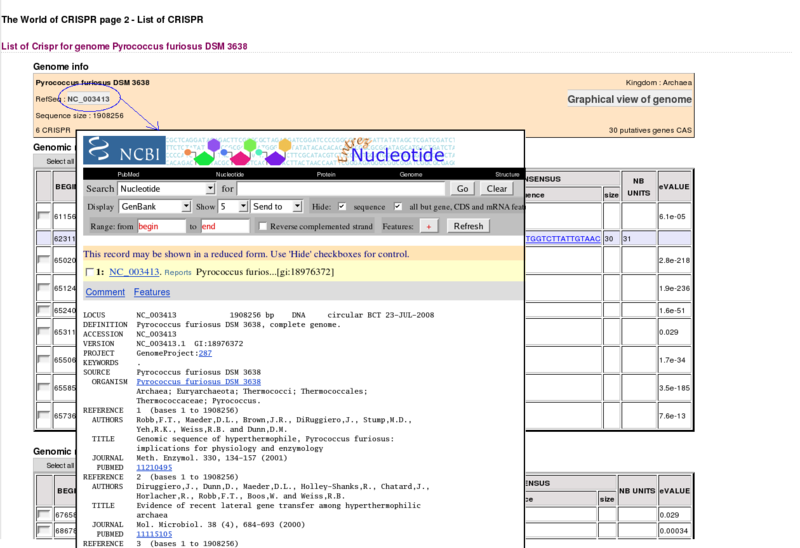 Annotations contain various elements such as positions, consensus unit, link to external NCBI information, link to genomic graphical circular view. Figure 3-3. Graphical circular view of a genome. Clicking on tha consensus link takes the user to the corresponding CRISPR's details. Various informations are displayed such as unit and spacer coordinates, unit and spacer sequences, Pygram image and consensus WebLogo image.